Eat Like a Dinosaur? Yes! It’s here, it’s here!!! 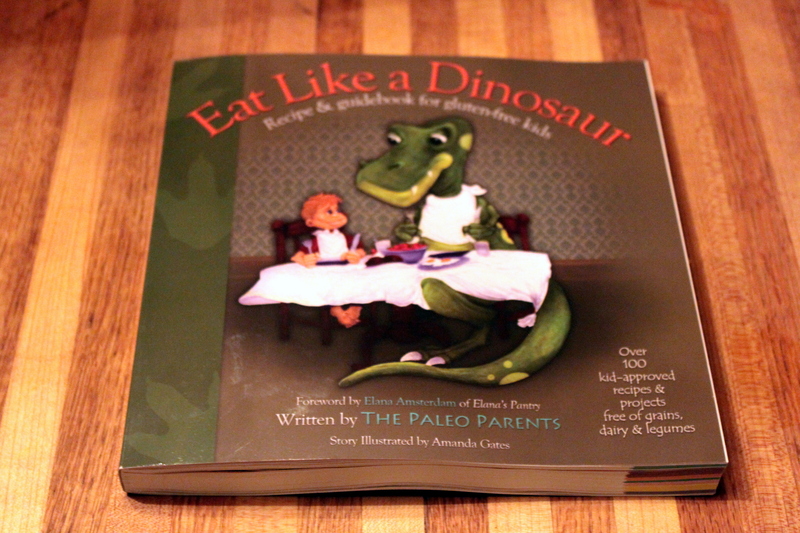 I have been waiting with bated breath for my copy of Eat Like a Dinosaur, the new kid-friendly cookbook from the Paleo Parents, to arrive in the mail and it came yesterday! Since our Paleo journey is just beginning, this is only the second cookbook that I own that is written from a Paleo perspective. Making the switch to Paleo had been the easiest thing I have ever done in my life, and my next mission is to switch the kids over to a Paleo diet. The hubs has been on board with me from the git-go! One of the biggest reasons I really want to switch the kids over is that, in our house, there is not a meal that goes by without my son, Garrett, asking “what’s for dessert”? Whether he has eaten 2 bites (and thinks that’s plenty to have dessert) or 50 bites (and I think he can’t possibly have room! ), he ALWAYS wants dessert. It really bothers me how much a part of his life processed sugar is, and I am determined to change it. The book’s authors, Stacy and Matt, have obviously put their heart and soul (and their love for their children) into every page of this book! I laid in bed last night and read it almost cover to cover and am amazed (and excited by what it means for me!) at what they have done. Losing a collective 200 pounds between them and switching their children’s diets to a healthier way of eating is nothing short of amazing and inspiring! I had to force myself to go to sleep! The “Boring Chapter for Parents” lit a fire under me that I have been needing. I have been slowly trying to convert the kids (Garrett is 6 and Mina is 15), but it has not been very easy. Stacy and Matt state quite simply, “transition quickly; be prepared to make concessions”. Being a nurse, it makes me think of pulling a band-aid off. Just rip it off…it’s done, and the pain is over much quicker! Having a teen who is set in her ways, and thinks she is right about most everything, and a little boy who lives for the ice cream truck on the weekends is going to make my task difficult, but not impossible with the help of Eat Like a Dinosaur. I am not opposed to giving my kids treats. In fact, I have no desire to cut that stuff out all together, but treats are just that. Treats. They are not an everyday thing but, when they have them, they can (and should be) healthy. Now, I will be making better choices for them thanks to ELaD. They have an entire chapter devoted to treats made with healthy alternatives, and it all looks delicious! When I cam home yesterday, I saw the box, knew what it was and ripped it open right away. 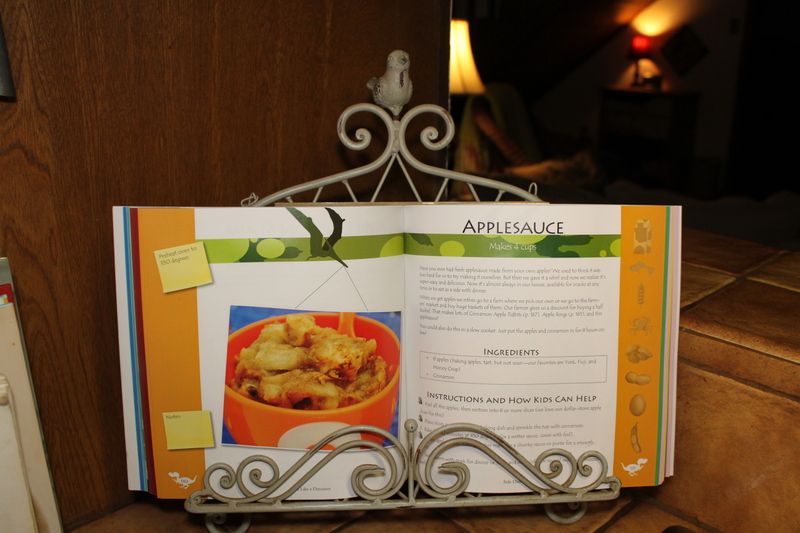 I began thumbing through it, wanting to test a recipe right then, and the recipe for applesauce stood out immediately! Garrett loves applesauce. And seriously, could it be any simpler? No. It could not. We had some apples already, so G and I got busy cooking! Yep, that’s right. 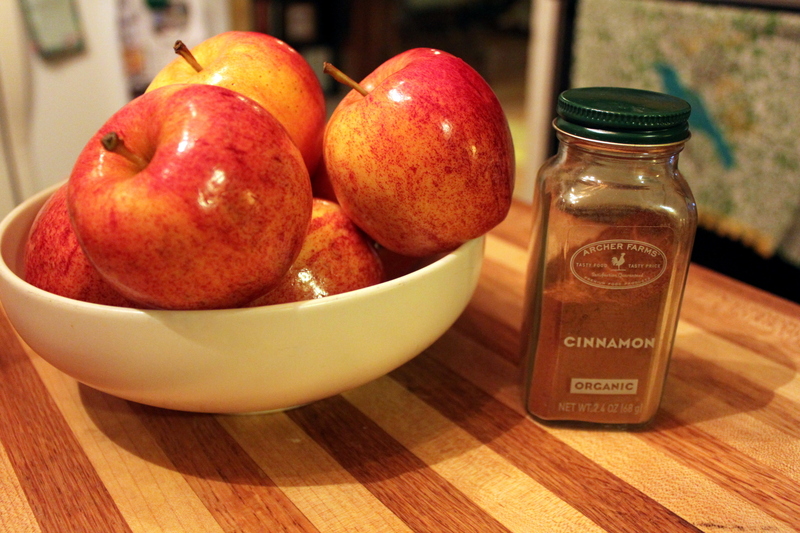 Apples and cinnamon. Told ya. Simple! 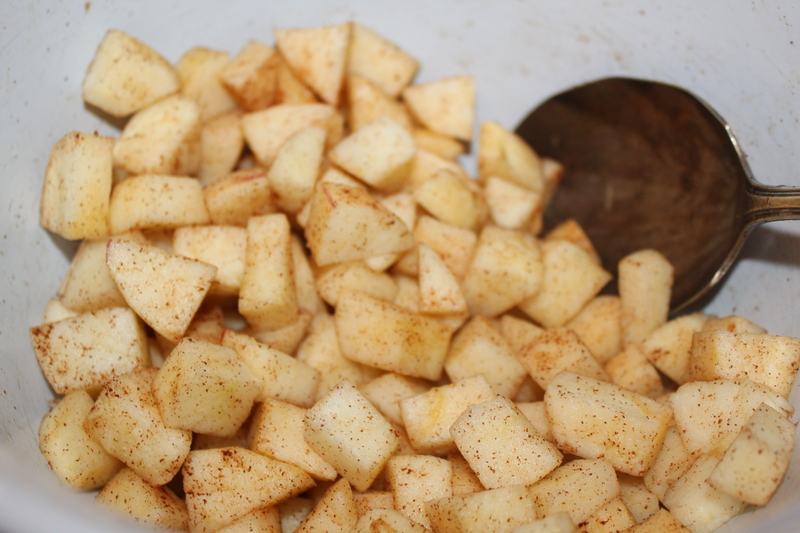 Peel and chop the apples then sprinkle with cinnamon. Yes, I chopped mine. This step is not necessary, but there is a reason why I chopped them. It’s because I love to chop. Seriously. I will happily chop anything you put in front of me. I have a gorgeous knife collection that I love to use and a beautiful block of wood on my counter that calls my name just about every time I walk by. It’s like my art. I could chop all day. I have even thought about being a sous chef just so I could chop! It’s my addiction. Maybe I need a 12 step program? If you have an apple slicer, it will make (very) short work of this recipe. Use it. Anyway, peel your apples, slice them (with whatever method you choose), put them in a baking dish, sprinkle with cinnamon and toss to coat. You can cover the dish with foil (for a wetter sauce) or not, but bake at 350 for an hour. 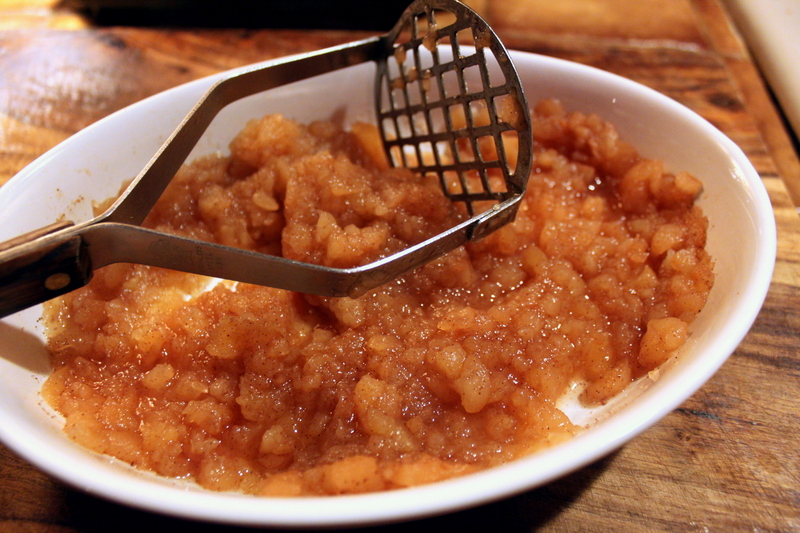 When it’s done, mash the apples with a potato masher. 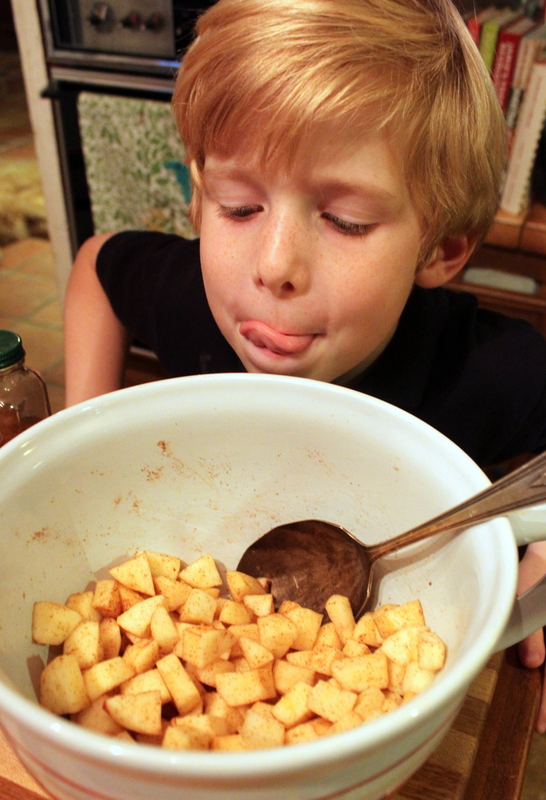 You can puree it in a food processor for a smoother sauce, but the kids and I like it chunky. Serve and enjoy…and feel good that you have given your kid a healthy alternative! Kids want they want. They (think) they know what they want because the TV tells them what they should want. It is a vicious cycle that is going to be challenging to stop, but I will stay the course. Tough love at it’s finest! I have a much larger arsenal now with Eat Like a Dinosaur in my hands and I plan to use all of it! They give you the tools and tips that you need to be successful and we will be working our way through this cookbook with gusto! 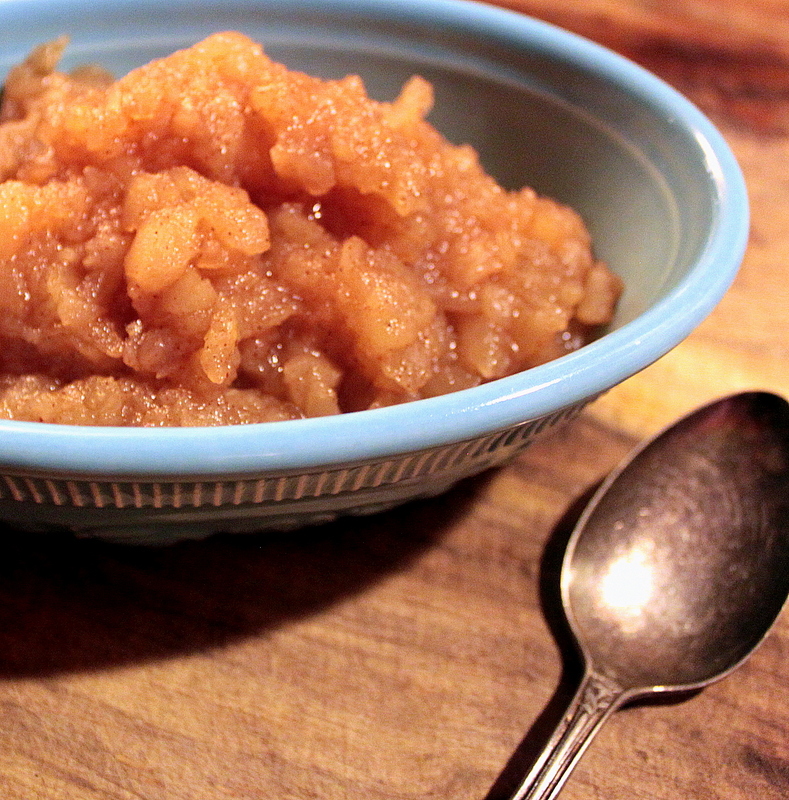 This entry was posted in Uncategorized and tagged apple, applesauce, cinnamon, dessert.